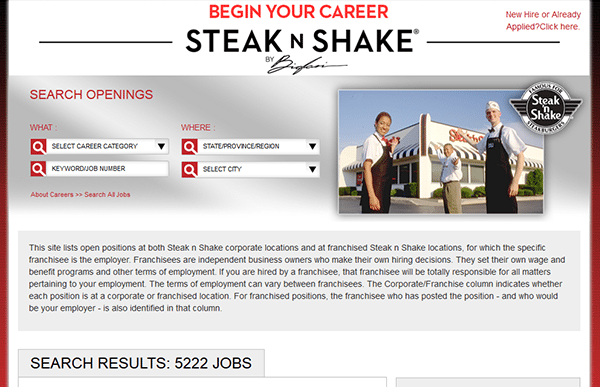 Use the links on this page to access both the online/offline versions of the Steak ‘n Shake application. The offline/printable version can only be used to apply for in-restaurant crew positions, whereas the online version can be used to apply for numerous career types. The online version of the form is available on the company’s careers site. 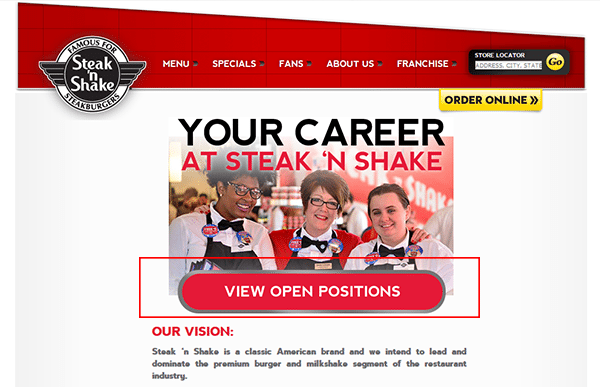 About the Company: Steak ‘n Shake is an American chain of restaurants that is headquartered out of Indianapolis, Indiana. The company was formed in 1934 and has more than 500 locations located both in the U.S. as well as abroad. Around 100 of the locations are owned/operated by franchisees. 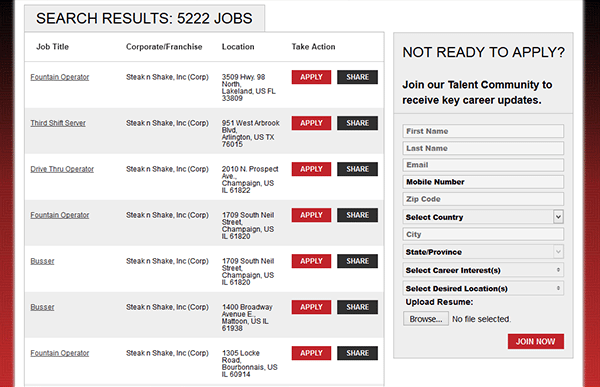 Step 2 – Click the “View Open Positions” button/link. Step 3 – Search for current openings by selecting a career category, state/province/region, or city from the drop-down lists. Step 4 – Scroll down the page, and click the job title link of the particular position that you’re interested in applying for. Step 5 – Click the link as seen below. Step 6 – Create a new account by pressing the “Start Here” button. Step 1 – Download the .PDF application by pressing the button at the top of this page.